Cool, cloudy and showers around here today. After breakfast I went to Kroger for a few items and then ran a couple of errands for Mom. Back home all caught up with everything and gave me a chance to lay down for a while, I’ve been dealing with a sinus headache the last couple of days or so. For dinner tonight I prepared Beef Quesadillas w/ Refried Beans. I came across the John Soules Foods Beef Fajitas at Walmart the other day and thought I would give it a try. It comes in a 2 serving package. To prepare it by package instructions; heat to 160f internal temperature. Do not overheat. Product is already fully cooked. Sizzle in skillet: 4-5 minutes (recommended) – place thawed fajita meat into skillet over medium high heat. (Spraying skillet with a non-stick cooking spray is optional.) Cook for 4 to 5 minutes, turning several times. And done! You can also prepare it by baking it and by microwave. The Beef is well seasoned and good grilled flavor. I think it would work great in a stir-fry also. Good item to have in the fridge, easy to prepare and excellent flavor. They have several varieties of Beef and Chicken products. I’ll try the Chicken soon! To go with Beef for the Quesadilla toppings I had 2 different types of Cheese; Sargento Reduced Fat Colby-Jack Shredded Cheese and Sargento Shredded Mozzarella Cheese. To prepare it I broke out my new Quesadilla Maker. I had bought it a few weeks ago and had not used until now. Just add 1 Tortilla, I used Mission Flour Soft Tortillas, on top of that add your Beef and sprinkle with Cheese. Add the second Tortilla on top and shut the lid, and cook. Just let it cook for 4-5 minutes and done. The Quesadilla maker automatically slices the Quesadilla, it has ridges in it that will slice the Quesadilla for you. It’s a breeze to clean up with its nonstick plates, good item to have. Had a side of Old El Paso Fat Free Refried Beans, Daisy Reduced Fat Sour Cream and Old El Paso Smoky Chipotle Taco Sauce (for dipping). Sprinkled chopped Cilatro and Smoked Paprika on top. The Quesadillas came out perfect! Golden Brown with the melted Cheese on top of the Beef. For dessert later a Healthy Choice Dark Fudge Swirl Frozen Greek Yogurt. Ingredients: Beef, Water Seasonings (Sodium Citrate Blend [Sodium Citrate And Sodium Acetate], Salt Spices, Garlic Powder, Onion Powder, Yeast Extract, Propylene Glycol, Lactic Acid, Papain, Bromelain), Coating Mixture (Modified Food Starch, Whey Protein Concentrate, Carrageenan, Sodium Citrate), Sodium Phosphate, Soy Lecithin. Contains: Milk, Soy. Directions: Heating instructions: heat to 160f internal temperature. Do not overheat. Product is already fully cooked. 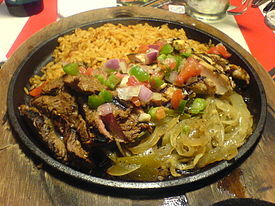 Sizzle in skillet: 4-5 minutes (recommended) – place thawed fajita meat into skillet over medium high heat. (Spraying skillet with a non-stick cooking spray is optional.) Cook for 4 to 5 minutes, turning several times. Conventional oven: 4-5 minutes – place thawed fajita meat into one layer on a flat baking sheet. Preheat oven to 375f. bake for 4 to 5 minutes. Microwave: 1-2 minutes – place thawed fajita meat into one layer on a microwave safe dish And cover. For 3 to 6 ounces, microwave on high for 30 seconds to 1 minute. For the entire package, microwave on high for 1 to2 minutes. Cook times may vary as microwaves vary in cooking intensity. Another gorgeous Spring Day out again, Sunny and 70’s! We are having our wooden deck painted today, slowly but surely repairing everything. Everyone seems to be having a problem with Ants this Spring, hate Ants worse than I do Spiders! Went to Kroger and bought some Ant Spray to spray in the house and around the house outside. Got the cart out for a while, went down to our community lake and got the mail, beautiful outside! For dinner tonight, Chicken Fajitas w/ Refried Beans. 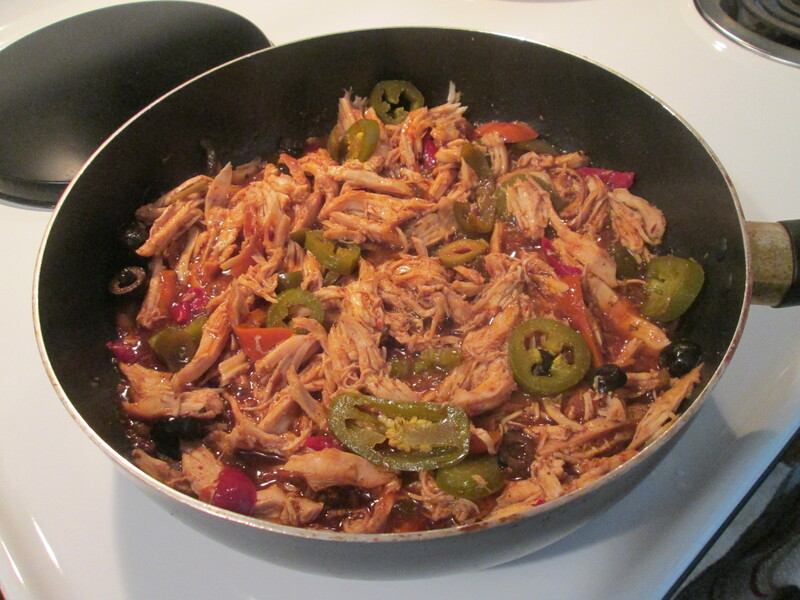 I used Ortega Fajita Skillet Sauce for my Fajita Sauce Base, I love using the Ortega Sauces. To prepare I’ll need the following; the Ortega Fajita Skillet Sauce, Simple Truth Roaster Chicken, Delallo Tri-Color Pepperazzi Spicy Sweet Peppers, Chopped Jalapeno slices, Daisy Reduced Fat Sour Cream, fresh Shredded Sargento Asiago Cheese, and Mission Yellow Corn Tortillas. For the Chicken I purchased a Simple Truth Rotisserie Whole Chicken from the Kroger Deli earlier. Pulled all the meat and using it for my Fajitas. I heated up a tablespoon of Extra Virgin Olive Oil in a medium size skillet over medium heat. I started by slicing the Sweet Peppers into strips and adding them to the skillet, stirring them and cooking until tender (about 4 minutes). Stirred in the Chicken and sliced Jalapenos, stirred this for about 5 minutes. Then added the Ortega Fajita Skillet Sauce, cooking another 3 minutes till everything was heated through. Heated up the tortillas in the microwave for 20 seconds and topped them with a dab of the Daisy Reduced Fat Sour Cream and the Chicken Fajita Mixture. I also topped it with some fresh grated Asiago Cheese, and served. 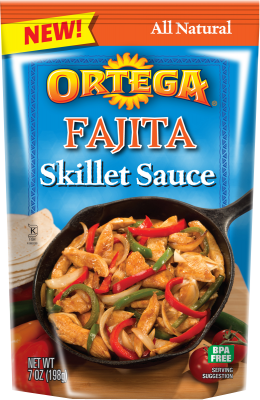 I keep packets of the Ortega Skillet Sauces in stock, it makes one delicious Fajita! Has a nice heat to it but not overpowering and the taste of the Ortega Sauce is incredible!Served with a side of Old El Paso Fat Free Refried Beans. For dessert later a Healthy Choice Dark Fudge Swirl Frozen Greek Yogurt. New, Ortega® Skillet Sauces are made with perfect combinations of fresh ingredients to bring Mexican dishes to life. Simply stir in the Skillet Sauce while cooking, and in no time you’ll have a mouth-watering meal the Ortega Fajita Skillet Sauceole family will enjoy. Look for our other delicious Skillet Sauce varieties including Taco and Cilantro & Green Chile! Enjoy Ortega’s delicious skillet sauce. Available in 3 great flavors in 7 oz stand up pouches. 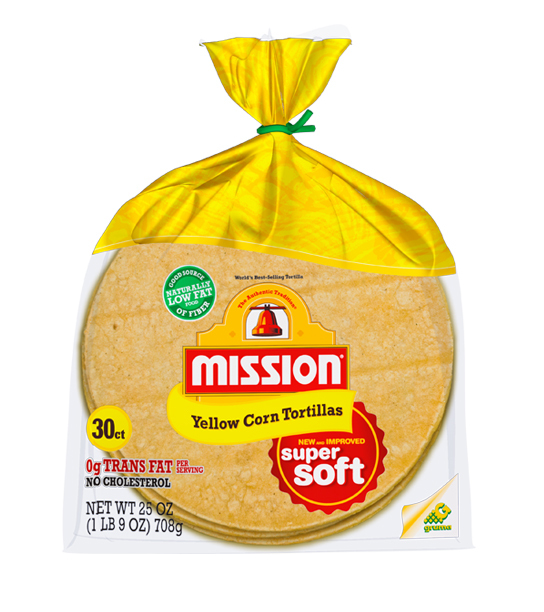 Mission Yellow Corn Tortillas are a classic favorite because we’ve perfected authentic flavor that you can use for enchiladas, flautas, chilaquiles, and more. It all comes from our Maseca® corn flour, which is the highest quality corn flour available. They’re even low-fat, with no lard and no cholesterol. Corn masa flour, water, cellulose gum, propionic acid (to preserve freshness), benzoic acid (to preserve freshness), phosphoric acid (preservative), guar gum, amylase. Still a bit cool this morning and we still got a cool breeze blowing, but lots of sunshine. Started off with a bowl of Kroger Brand Bran Flakes. Cleaned up the kitchen and had my morning workout. Cleaning the house was about it. Went to the bank and dropped off some letters at the Post Office, also stopped at the car wash and had my car cleaned inside and out. 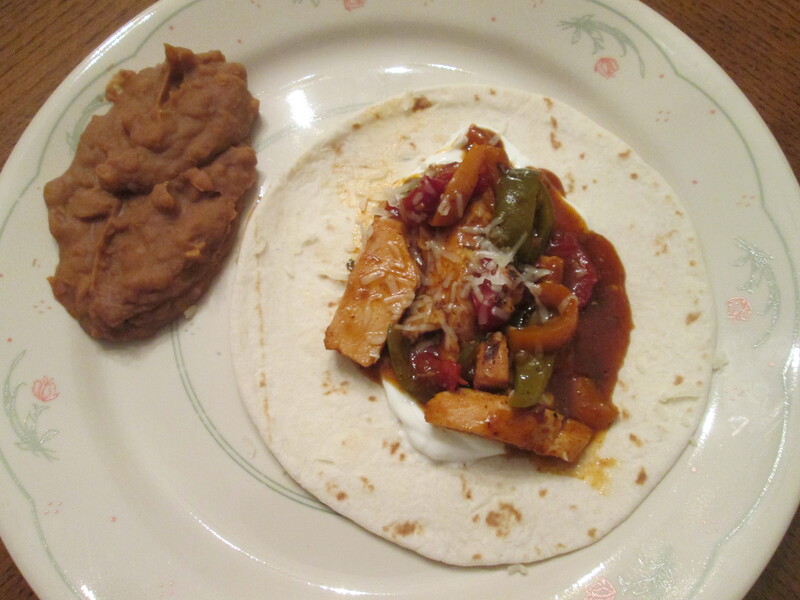 For dinner tonight Chicken Fajitas w/ Refried Beans. I used Ortega Fajita Skillet Sauce for my Fajita Sauce Base, I love using the Ortega Sauces. 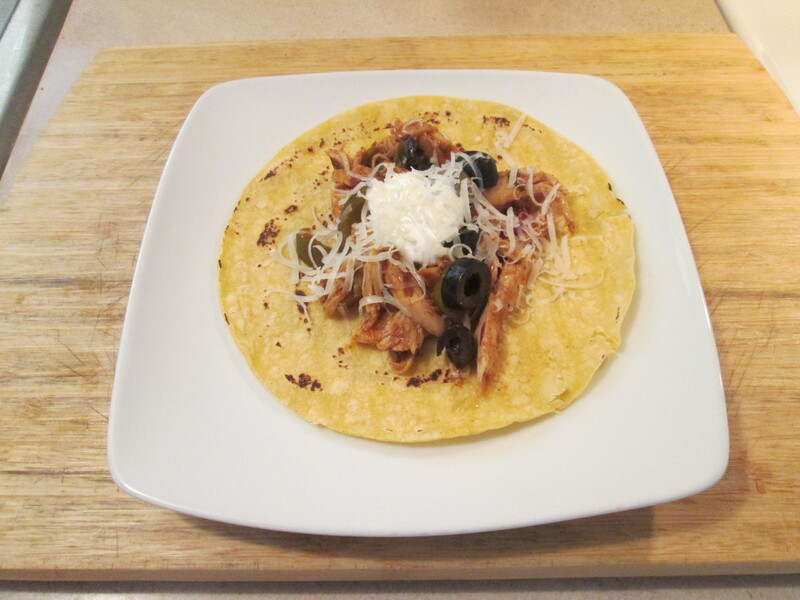 To prepare I’ll need the following; the Ortega Fajita Skillet Sauce, Simple Truth Roaster Chicken, Delallo Tri-Color Pepperazzi Spicy Sweet Peppers, Chopped Jalapeno slices, Daisy Reduced Fat Sour Cream, fresh Shredded Sargento Asiago Cheese, and Mission Flour Tortillas. Same ingredients as the other night except a different Ortega Sauce and I’m using Chicken instead of Shrimp. For the Chicken I purchased a Simple Truth Rotisserie Whole Chicken from the Kroger Deli earlier. Pulled all the meat and used it for my Fajitas. I heated up a tablespoon of Extra Virgin Olive Oil in a medium size skillet over medium heat. I started by slicing the Sweet Peppers into strips and adding them to the skillet, stirring them and cooking until tende r (about 4 minutes). Stirred in the Chicken and sliced Jalapenos, stirred this for about 5 minutes. Then added the Ortega Fajita Skillet Sauce, cooking another 3 minutes till everything was heated through. Heated up the tortillas in the microwave for 20 seconds and topped them with a dab of the Daisy Reduced Fat Sour Cream and the Chicken Fajita Mixture. I also topped it some fresh grated Asiago Cheese, and served. 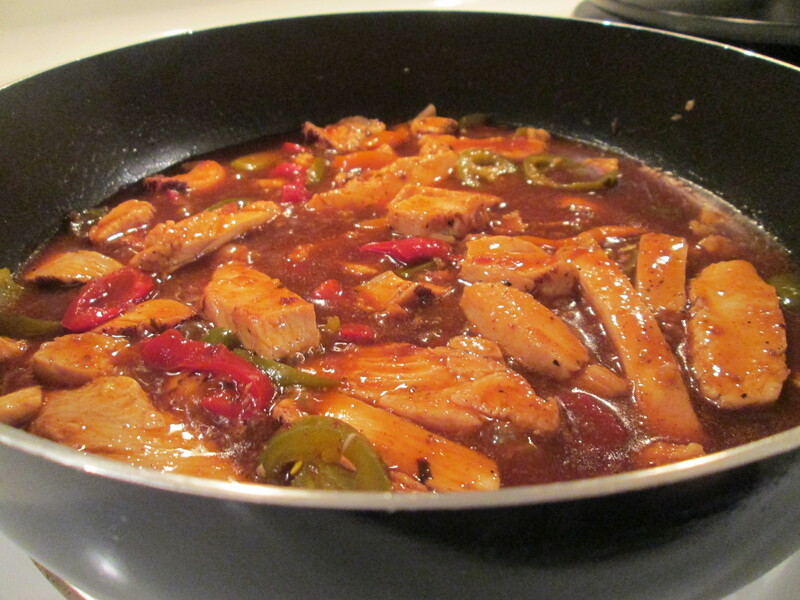 I keep packets of the Ortega Skillet Sauces in stock, it makes one delicious Fajita! Had a nice heat to it but not overpowering and the taste of the Ortega Sauce is incredible!Served with a side of Old El Paso Fat Free Refried Beans. For dessert later a Healthy Choice Dark Fudge Swirl Frozen Greek Yogurt. 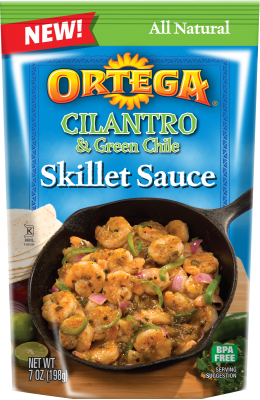 New, Ortega® Skillet Sauces are made with perfect combinations of fresh ingredients to bring Mexican dishes to life. Simply stir in the Skillet Sauce while cooking, and in no time you’ll have a mouth-watering meal the wh ole family will enjoy. Look for our other delicious Skillet Sauce varieties including Taco and Cilantro & Green Chile! I had a Ham and Scrambled Egg Sandwich for Breakfast this morning. Using Boar’s Head Sm oked Honey Ham, 1 medium Egg (Scrambled), A shake or two of frank’s Hot Sauce in the Egg, and a Kroger Wheat Hamburger Bun (Toasted). Along with my morning brew of Bigelow Decaf Green Tea, I was ready for the day! Not too bad out today, sunny and in the low 30’s. They say in the 50’s tomorrow but rain all day. Got out and cleared the driveway of the remaining snow and ice. Then got out and ran an errand for Mom and stopped by the bank and back home. For dinner tonight, last night’s leftovers makes my dinner tonight. 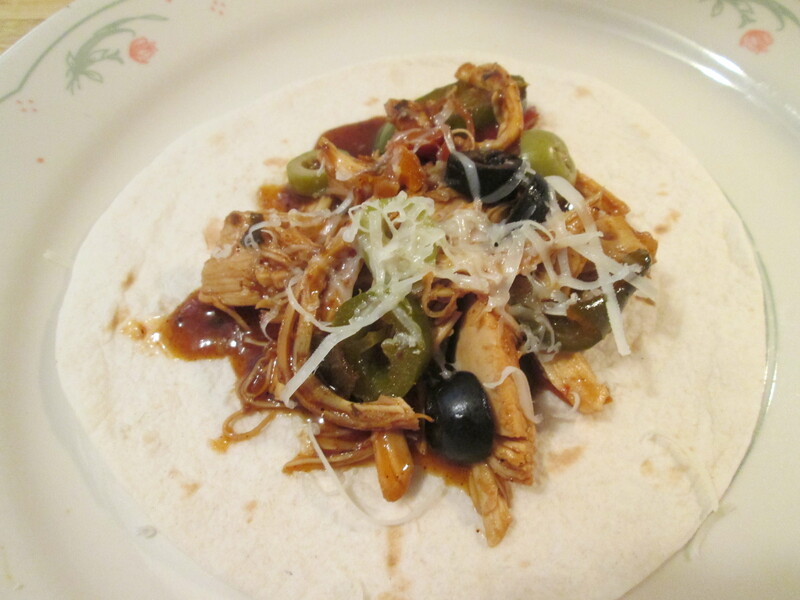 I prepared a Chipotle Honey – Roasted Chicken w/ Stewed Pinto Beans Fajitas. Yesterday’s meal of Chipotle Honey – Roasted Chicken w/ Stewed Pinto Beans was so good that I was going to make sure that the leftovers did not go to waste! So tonight I made the leftovers into Chipotle Honey – Roasted Chicken w/ Stewed Pinto Beans Fajitas. I used Mission Flour Fajitas. I started by shredding one of the Chipotle Honey – Roasted Chickens, using the Bear Paw. I had purchased the Bear Paw Meat Shredder on Amazon last week, come in handy for shredding meat and removing meat from the roasting pan onto a platter. So I shredded the Chicken and then put it into a small sauce pan and reheated it. As the Chicken was heating, in another small sauce pan I reheated the Stewed Pinto Beans. Once both were reheated I took a Fajita and first spread Chicken on it and then the Stewed Pinto Beans. I topped it with a few shakes of the Frank’s Hot Sauce and sprinkled some fresh grated Dutch Gouda Cheese. Not only did this make a great dinner last night, it made another delicious meal for me tonight. Makes one hearty Fajita! The Hot Sauce and Gouda Cheese just added that extra flavor. For dessert later a Healthy Choice Dark Fudge Swirl Frozen Greek Yogurt. 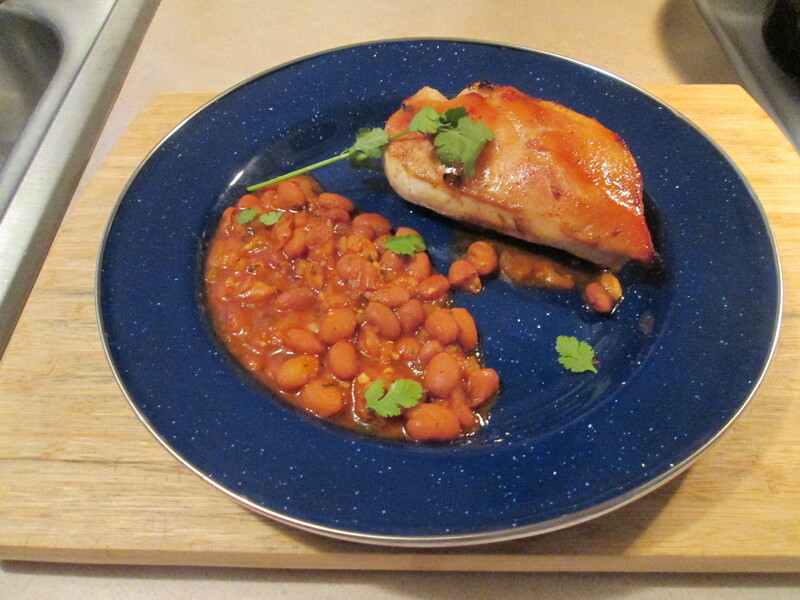 I’ve left the original post with full recipe for the Chipotle Honey – Roasted Chicken w/ Stewed Pinto Beans below. To prepare it, preheat the oven to 400 degrees. Line a rimmed baking sheet with foil and mist with cooking spray. In a small bowl , combine Honey, 2 tsp Oil, Lime Juice, 1/4 tsp Chile Powder, 1/4 tsp Sea Salt, and Black Pepper. Using Paper Towels, pat Chicken dry and place on prepared sheet. Brush Chicken evenly with Honey Mixture. Roast for about 30 to 35 minutes, turning over halfway, until golden brown and Chicken reaches 165 degrees when tested with an instant read thermometer in thickest part. Remove from oven, cover and let rest for 5 minutes. Using tongs, turn Chicken to dip both sides in caramelized juices on sheet. (Alternatively, use a brush to brush it on.) Meanwhile, in a medium saucepan on medium, heat remaining 1/2 tsp Oil. Add Onion, Garlic, Jalapeno, remaining 1/4 tsp Sea Salt.Saute until Onion is soft, about 5 minutes. Add Tomato Paste and saute for 1 minute. Add Beans and Broth, and bring to a simmer on medium high. Cover, reduce heat to low and simmer for 25 minutes more. Stir in Lime Zest and 2 tbsp Cilantro. To serve divide Beans on to bowls or plates and top each serving with 1 piece Chicken. Drizzle any remaining Juices from baking pan over Chicken and sprinkle with remaining tbsp Cilantro. Fairly easy to prepare and worth anytime it takes. The Chicken is just flat out delicious! The Spices, Lime and Jalapeno all combine to make one flavorful Chicken Breast. Also the recipe turns out a good Bean dish also, that makes the perfect side dish for the Chicken. Another Keeper Recipe. For dessert later a Healthy Choice Dark Fudge Swirl Frozen Greek Yogurt. 1 – Preheat oven to 400 degrees. Line a rimmed baking sheet with foil and mist with cooking spray. 4 – Meanwhile, in a medium saucepan on medium, heat remaining 1/2 tsp Oil. Add Onion, Garlic, Jalapeno, remaining 1/4 tsp Sea Salt.Saute until Onion is soft, about 5 minutes. Add Tomato Paste and saute for 1 minute. Add Beans and Broth, and bring to a simmer on medium high. Cover, reduce heat to low and simmer for 25 minutes more. Stir in Lime Zest and 2 tbsp Cilantro. 5 – Divide Beans among shallow bowls and top each serving with 1 piece Chicken. Drizzle any remaining Juices from baking pan over Chicken and sprinkle with remaining tbsp Cilantro. Not much going on today, very laid back. Did a small load of laundry and ran the sweeper. It’s so much easier to vacuum since I bought the Hoover Cordless Lightweight Vacuum! It only weighs about 10 lbs., Cordless, and has as much power as a normal size vacuum. Great investment! Had everything done early so it’s Couch Potato, Remote, and Football for the day. For dinner tonight it’s Chicken Fajitas w/ Refried Beans. The other night I had Shrimp Fajitas and they were just so delicious I decided to have Chicken Fajitas for dinner tonight. I used Ortega Fajita Skillet Sauce for my Fajita Sauce Base, I love using the Ortega Sauces. To prepare I’ll need the following; the Ortega Fajita Skillet Sauce, a bag of Simple Truth Chicken Fajita Strips, Delallo Tri-Color Pepperazzi Spicy Sweet Peppers, Chopped Jalapeno slices, Daisy Reduced Fat Sour Cream, fresh Shredded Sargento Asiago Cheese, and Mission Flour Tortillas. Same ingredients as the other night except a different Ortega Sauce and I’m using Chicken instead of Shrimp. 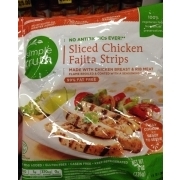 First time using the Simple Truth Chicken Fajita Strips. This is a fantastic item to have in the fridge or freezer. They’re 99% Fat Free, already Seasoned, and cook up in 6-8 minutes. They came out well seasoned and the strips are nice and meaty. I heated up a tablespoon of Extra Virgin Olive Oil in a medium size skillet over medium heat. I started by slicing the Sweet Peppers into strips and adding them to the skillet, stirring them and cooking until tender (about 4 minutes). Stirred in the Chicken Strips and sliced Jalapenos, stirred this for about 6 minutes. Then added the Ortega Fajita Skillet Sauce, cooking another 3 minutes till everything was heated through. Heated up the tortillas in the microwave for 20 seconds and topped them with a dab of the Daisy Reduced Fat Sour Cream and the Chicken Fajita Mixture. I also topped it some fresh grated Asiago Cheese, and served. I keep packets of the Ortega Skillet Sauces in stock, it makes on delicious Fajita! Had a nice heat to it but not overpowering and the taste of the Ortega Sauce is incredible!Served with a side of Old El Paso Fat Free Refried Beans. For dessert later a Healthy Choice Dark Fudge Swirl Frozen Greek Yogurt. Simple Truth Natural Chickens are raised on an all-natural, 100% vegetarian diet, free of any animal by-products or synthetic additives. boneless skinless chicken breast with rib meat, water, seasoning (food starch, sea salt, garlic powder, onion powder, spices, chicken broth, mustard), vinegar. New, Ortega® Skillet Sauces are made with perfect combinations of fresh ingredients to bring Mexican dishes to life. Simply stir in the Skillet Sauce while cooking, and in no time you’ll have a mouth-watering meal the whole family will enjoy. Look for our other delicious Skillet Sauce varieties including Taco and Cilantro & Green Chile! A fajita (/fəˈhiːtə/; Spanish: [faˈxita] is a term found in Tex-Mex cuisine, commonly referring to any grilled meat usually served as a taco on a flour or corn tortilla. The term originally referred to the cut of beef used in the dish which is known as skirt steak. Popular meats today also include chicken, pork, shrimp, and all cuts of beef. In restaurants, the meat is often cooked with onions and bell peppers. Popular condiments are shredded lettuce, sour cream, guacamole, salsa, pico de gallo, cheese, and tomato. The northern Mexican variant of the dish name is Arrachera. 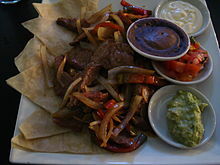 Fajita is a Tex-Mex, Texan-Mexican American or Tejano, diminutive term for little meat (beef) strips. Founded in South Texas, Rio Grande Valley. The word fajita is not known to have appeared in print until 1971, according to the Oxford English Dictionary. The exact time in which the dish was named fajita means little belt. The word faja is Spanish for “strip”, “band”, “sash”, or “belt”. The first culinary evidence of the fajitas with the cut of meat, the cooking style (directly on a campfire or on a grill), and the Spanish nickname going back as far as the 1930s in the ranch lands of South and West Texas. During cattle roundups, beef were butchered regularly to feed the hands. Throwaway items such as the hide, the head, the entrails, and meat trimmings such as skirt were given to the Mexican cowboys called vaqueros as part of their pay. Hearty border dishes like barbacoa de cabeza (head barbecue), menudo (tripe stew), and fajitas or arracheras (grilled skirt steak) have their roots in this practice. Considering the limited number of skirts per carcass and the fact the meat wasn’t available commercially, the fajita tradition remained regional and relatively obscure for many years, probably only familiar to vaqueros, butchers, and their families. The food became popular in Tex-Mex restaurants in Houston, Austin, and San Antonio. In southern Arizona, the term was unknown except as a cut of meat until the 1990s, when Mexican fast food restaurants started using the word in their marketing. In recent years, fajitas have become popular at American casual dining restaurants as well as in home cooking. In many restaurants, the fajita meat is brought to the table sizzling loudly on a metal platter or skillet, with the tortillas and condiments. Finally a day without the high humidity! It was about 72 for a high today. Ran some errands early and then back hom. Got the cart out and did a little fishing and then just rode around enjoying the day. 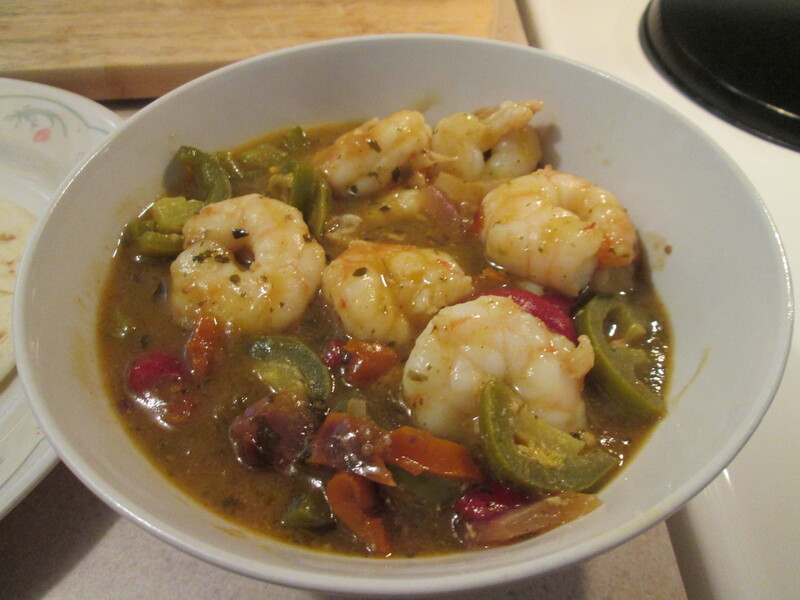 For dinner tonight; Sweet Pepper, Cilantro and Green Chile Shrimp Fajitas. I used a packet of the Ortega Cilantro and Green Chile Skillet Sauce. If you like Shrimp Fajaitas you have to give this sauce a try! 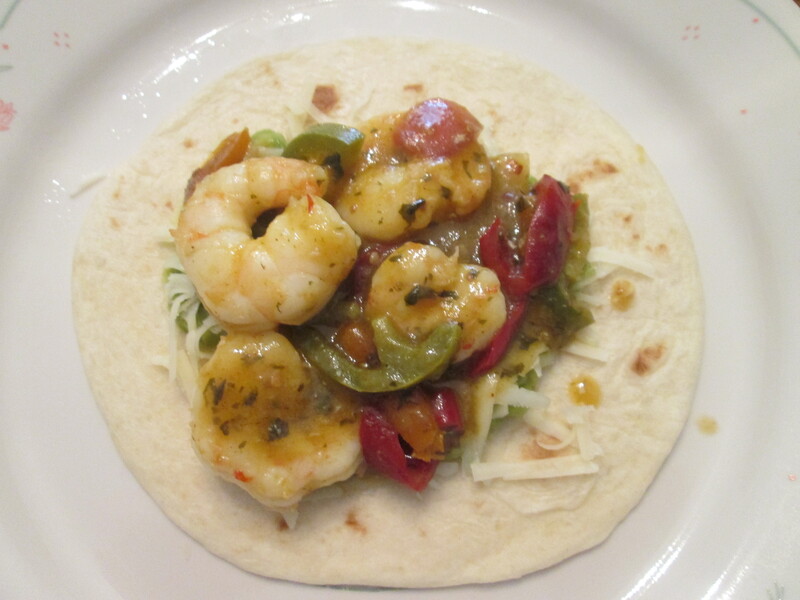 To prepare it I used a bag of Kroger Seafood Jumbo Shrimp along with the packet of Ortega Cilantro and Green Chile Skillet Sauce, Delallo Tri-Color Pepperazzi Spicy Sweet Peppers, Chopped Jalapeno slices, Chopped Red Onion, fresh Shredded Asiago Cheese, and Ole Fajita Flour Tortillas. I rinsed and drained my Shrimp off in a colander. I then heated up a tablespoon of Extra Virgin Olive Oil in a medium size skillet over medium heat. I started by slicing the Sweet Peppers into strips and adding them to the skillet along with the Chopped Red Onion, stirring them and cooking until tender (about 4 minutes). Stirred in the Shrimp and sliced Jalapenos, stirred this until the Shrimp just started turning pink. Then added the Ortega Cilantro and Green Chile Skillet Sauce, cooking another 4 minutes till everything was heated through. What an aroma coming from the skillet! Heated up the tortillas in the microwave for 20 seconds and topped them with Guacamole and the Shrimp Taco Mixture. I also topped it some fresh grated Asiago Cheese, and served. I keep packets of the Ortega Cilantro and Green Chile Skillet Sauce in stock, it makes on delicious Fajita! It’s a nice heat to it but not overpowering with a fantastic medley of flavors. Winner, Winner, Shrimp Fajitas! For dessert/snack later a Jello Sugarless Dark Chocolate Mousse. New, Ortega® Skillet Sauces are made with perfect combinations of fresh ingredients to bring Mexican dishes to life. Simply stir in the Skillet Sauce while cooking, and in no time you’ll have a mouth-watering meal the whole family will enjoy. Look for our other delicious Skillet Sauce varieties including Taco and Fajita! TOMATILLOS, WATER, ONIONS, POBLANO PEPPERS, SUGAR, CILANTRO LEAVES, CORNSTARCH, AGAVE NECTAR, SALT, SERRANO PEPPERS, CANOLA OIL, KEY LIME JUICE, GREEN CHILES, ONION POWDER, GARLIC POWDER, EXTRA VIRGIN OLIVE OIL.